Sometimes it might be difficult to fit going to the gym into our very busy daily lives. Just because we can’t hit the gym doesn’t mean we can’t get a decent burn from working out at home. These body-weight exercises are proven to give you a great burn, improve fitness, core strength and burn body fat giving you a lean physique. 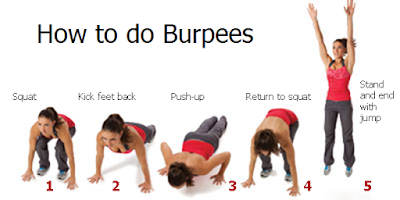 The intention of these exercises is to concentrate on core strength and endurance. You should aim to complete all exercises in turn without any or with very minimal rest time between each station. 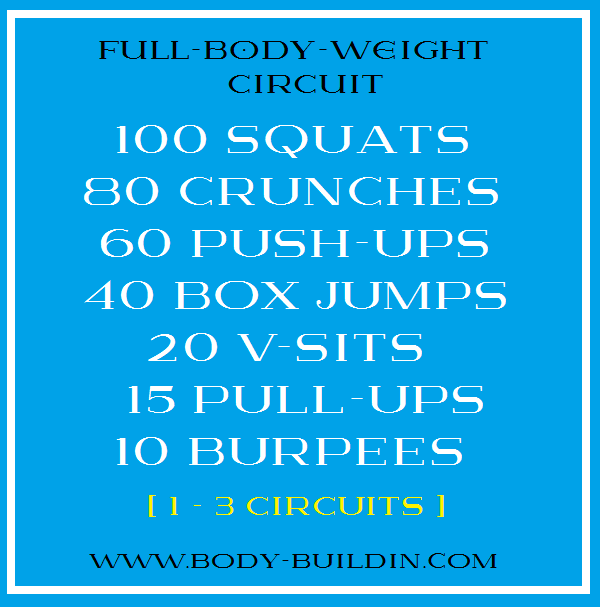 I generally set out to complete this full circuit in approximately 20 minutes. You may be lead to believe that body-weight exercises only work for endurance or fitness, the truth is body-weight training does help with these areas but it also generates or simulates muscle growth and definition. 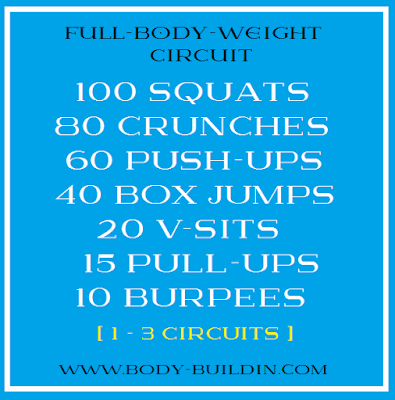 Put together as a body-weight circuit, these exercises can help you achieve a nice physique. This will really get your heart pumping and legs burning. You may think that body-weight squats are easy and to be honest the first 30 or so are, but this is all about being able to push through when the lactic acid starts to build up and your legs feel heavy. Be sure to keep you back straight, squat down to the lowest point possible without leaning forward and drive upwards through your heels. Pushing up on your toes with move your center of balance forward and you want to keep you core engaged at all times. The trick with crunches is to not let your feet touch the floor no matter how much your abs are burning, this is where the results come from. Lay on your back, cross your arms and place them on your chest or touch your temples with your fingertips. As you crunch from the stomach, raise your knees to the ceiling bending them to 45 degrees then stretching out flat again as your lower your upper body back to the floor. This is one repetition. Arguably one of the most basic fitness exercises and one that can be performed by most people; either in the full extended position or by shortening to the knee. Place your hands on the floor approximately shoulder width apart and keep your body rigid and in one line from shoulders to your heels. You should be raised off the floor on both hands and your toes only, lower yourself to the floor keeping your body in one continuous line. Do not touch the floor and push yourself back up until your arms are straight. If you can't do 60 continuous push-ups, take a short break after each 15-20 reps. Learn more about how to perform a perfect push-up at this link. Possibly one of the hardest to perform at home, but as long as you’ve got a solid raised surface you can complete this exercise. A sturdy chair will work if you have a partner who can hold it while you jump on and off it. The surface or chair should be at least knee height ideally to get the best pump and end results. 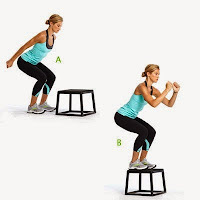 This exercise is exactly as it’s titles, you need to jump on to a box (or other raised flat surface) extend and straighten your body once landed then jump off. This is one repetition. At this point you should be breathing heavier and your heart should be beating harder. Lay on your back and raise your feet to the ceiling shoulder width apart keeping your legs as straight as possible. Reach with your hands (arms extended) to touch your feet. Try to keep your legs raised at all times and crunch from your stomach to touch your toes. Touching your toes ones is one repetition. Pull-ups are both a test of strength but also of technique and personally I find getting in a rhythm really helps with these. The hardest part of performing pull-ups at home is find a suitable place to hang with enough room to pull your head above your wrists. In some houses you can do this on the underside of stairs, or if you own a portable pull-up bar, you can attach this to most door frames. Once you get the hang of the right technique these are really easy to do, it’s just a matter of having enough strength to do all 20 repetitions. Hang with your feet off the floor and arms extended fully and palms facing away from your. Pull yourself up until your head is level with or above your wrists then lower yourself back to having extended arms. This is one repetition. Time to test the cardio reserves and the last bit of energy in your core and legs. Back in the push-up position, keep your hands on the floor and jump your feet into a squat position under your shoulders. Jump up and land back in the squat position, then spring your feet backwards into the original position. This is one repetition. Kevin Hodges owner of crazygain.com has been involved in sport and fitness from a very early age. Started bodybuilding as a hobby and now continues to work out whilst using experience to guide and train others. Also reviews bodybuilding and fitness supplements for maximum results. A recent post of his titled: “Drink Water and Lose Weight” is an interesting read for everyone with an interest in fitness, sports and bodybuilding who want to use readily available resources to stay in great shape.